Reading a Shelby Stephenson book reminds me of listening to my grandfather talk. Both love nothing more than a good story, and whether good or bad, there is always an undercurrent of fondness for the past that has been tempered by time and perspective. “Southernisms”, names of dogs and people, and places I’ve grown up around are scattered across the pages Stephenson’s latest book, weaving together small stories into the narrative that is Elegies for Small Game. A song words cannot tell? These lines from “The Song of the Small Farmer’s Son” capture the emotion of trying to remember and relate the past to those who have never known that life. My grandfather knew the scenes described in this poem: the fields, the dogs, the mules. I, on the other hand, have only ever known the picturesque scene of an open field, hunting dogs from a distance, and fell off a mule I attempted to ride. But I am a native of southeastern NC, and though the face of the land has changed, the heart has not. 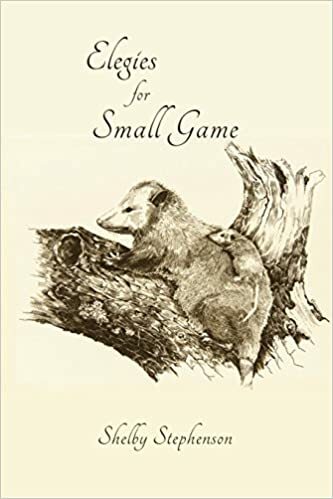 The small game, the opossums, martins, and foxes still roam, and Stephenson applies this to the “small game” he once was as well, shown through memories of watching his father deal with the pain of losing a hunting dog he so loved or riding with his family in their ’37 Ford. Little moments matter the most, and Stephenson shows us how we can get the most meaning from them. Poems such as “Fledgling Purple Martins” and the subsequent “Lines for the Birds”, respectively, admire the beauty of the young birds taking flight, followed by Stephenson killing a snake to protect fledglings but leaving sneaky cowbird eggs in the nest. It’s a struggle many face: there is beauty in life and in letting youth begin their solo journeys. But there is also an urgency to not want to let them go or to attempt to make everything turn out “right” (we don’t always succeed), but in the end, we must choose our battles carefully and remember that “We last as long as pads, soles, or wheels roll!” Much like remembering things now past, there comes a taste of grief with the joy of things moving forward. One of the most tender poems of the collection is “Boogie”, a piece written with the memory of his brother, Paul, in mind. The poem holds a steady rhythm, and sections are held together by both imagery and internal rhyme that make you feel like you’re floating through a memory. Paul protected small game, both his dog, Boogie, and his little brother, and he did it out of love. And there is nothing quite like the bond born out of love first extended, and nothing quite like the pain that comes from losing that bond. Stephenson also reaches beyond the borders of his hometown within these pages, as shown with his piece “Meditation on Guns”. He lends his pen to memorializing not only his childhood, but commenting on the Newtown shooting. It is a difficult thing to understand, and Stephenson’s piece here is not so much written like a poem as it is an essay, working its way through an attempt to reconcile memories of hunting and a gun that he owns but never uses with the tragedy of Newtown. It is subtle; Stephenson clearly recognizes that what was before, much like the people in his hunting stories, is now gone. He doesn’t offer solutions or make a bold claim about guns, and while a part of me wishes he would just “say it”, there is also a tone of sorrow and respect throughout; the words of a man who, like many of us, doesn’t quite know what to do or say. Shelby Stephenson’s Elegies for Small Game takes you on a journey through the memory and musings of a man from rural North Carolina. There is a yearning for the past that is sentimental without being sappy, and that is one of this book’s greatest strengths. Little moments filled with love and grief and the essence of what makes up life are embedded within each poem, and it is this beautiful combination that makes this collection a thought-provoking, enjoyable read.